Everyone always thinks that therapy has to involve these super expensive items with high priced therapists traipsing through your house at all hours of the day. This could not be further from the truth. 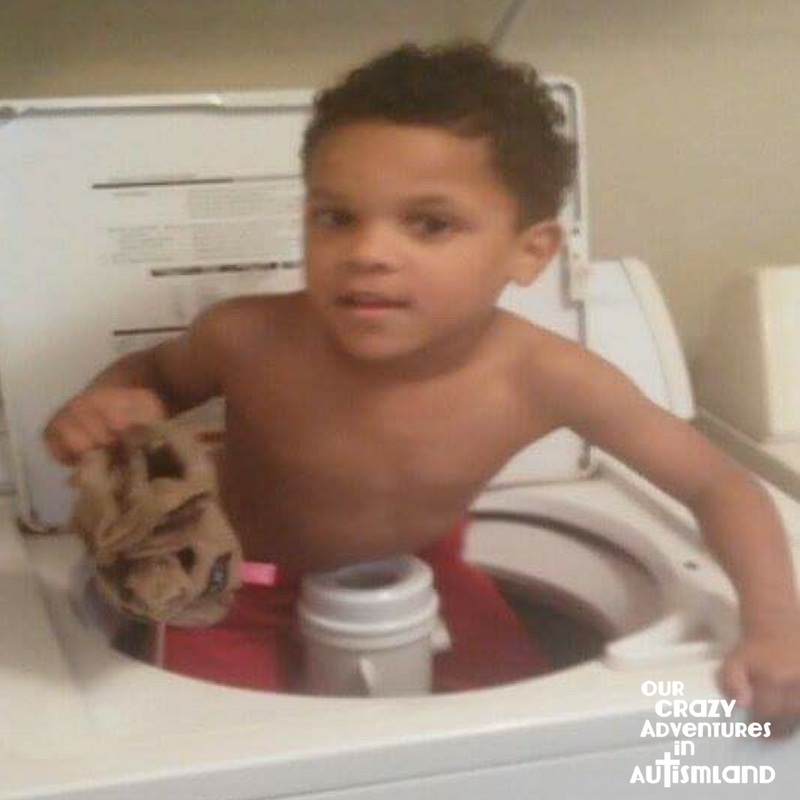 Here in autismland, we use everyday chores to help us achieve some of our RDI Objectives. We establish a rhythm. He hands it to me and I put it in the pile. I hold my hand up high. He doesn’t immediately get it so I wave my hand up high. He smiles at me and throws it to the high hand. We do that a couple of times. I go back to the established rhythm. After several items, I start pointing to the pile that he needs to put it in. He gets that challenge immediately. Back to the established rhythm. I glance at the pile that it needs to go in. A little scaffolding needed so I nod my head in the direction of the pile that I am looking at. Success! Back to the established rhythm.. I get really fast and he picks up speed after noticing immediately that I sped up. I slow way down. Way down. He slows down but keeps asking me if my leg is hurt. Why am I going slow like an old person? (Gotta love his analogy). I smile and keep going slow. Finally, we are done. High Fives and a big thanks! 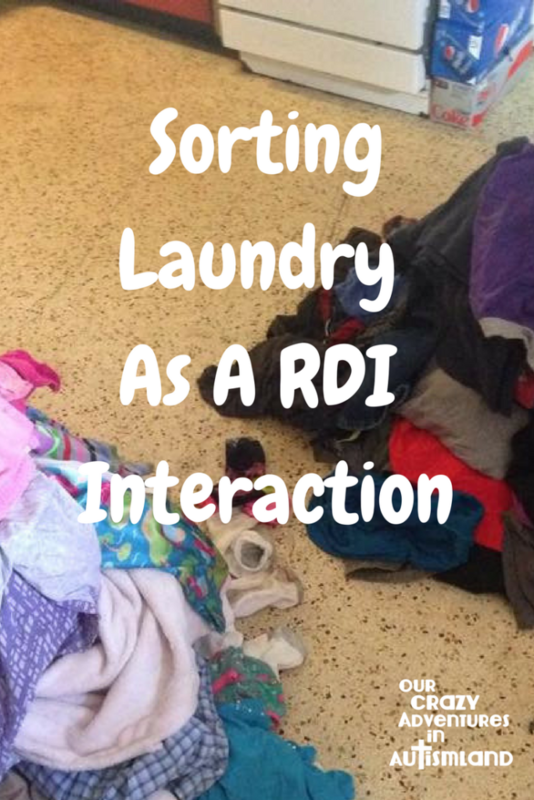 RDI Objective: Child engages in uncertain situations while recognizing that they face no performance demands or judgments and that parents are available on an “as-needed” basis. You simply do a task with another person just to be able to hang out with that person. It was a successful interaction. He felt competent and achieved most of the challenges. He took to the redirection well and stayed with me through all of it. That is an amazing feat right there! We seem to have the master / apprentice roles down pat. It was a bit long though. You don’t want most interactions to be this long. Short and sweet is the best motto. I needed to frame more when he got off on a Halo: The Master Chief Collection tangent ( for those unfamiliar it is a war game that his DAD let him play and now he is obsessed!). I usually have three hampers, filled to the brim. I’d like to let you think they are sorted by colored, white, and linens. But, I don’t want lightning to strike my laptop dead. Great discription, it really helped me get an idea of how to do something like that!